All FBYC rosaries feature the ten youth center patrons saints on the double sided decade Glory/Our Father beads. Saint John Paul II, & Saint Maximillian Kolbe, Saint Therese of Lisuex & Blessed Pier Giorgio Frassati, Saint Maria Goretti & Saint Anthony, Saint Padre Pio & Saint Michael. Featured on the initial Our Father is a double sided medallion, one side the FBYC logo and the ther side the FBYC crown of thorns heart as seen on the chapel tabernacle. With the initial Glory bead featuring our Benediction connections. The joining medallion features on one side is a beautiful rendition of the FBYC Monstrance, and on the other side Our Lady, Undoer of Knots. The Crucifix is depicts Christ, the Vine and the Branches. All medellions are antiqued brass and the beads vary depending on price. A great rosary for every day use, featuring all the FBYC patron saints. 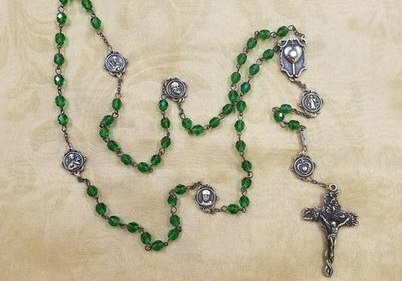 This rosary has green glass beads and is a great gift for our younger retreat goers. Number required - Green Glass Beads REQUIRED (Select One) 0 1 2 3 4 Please fill out this field. 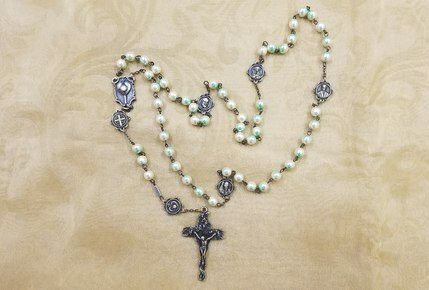 This is our mid range rosary, with beautiful pearl white glass beads. This would make a beautiful gift for First Communion, Confirmation, or even a wedding. Number required- Pearl White Beads REQUIRED (Select One) 0 1 2 3 4 Please fill out this field. This beautiful redition of the FBYC Rosary in semi precious stone (Malachite) is a beautiful rosary that would make a great keep sake. 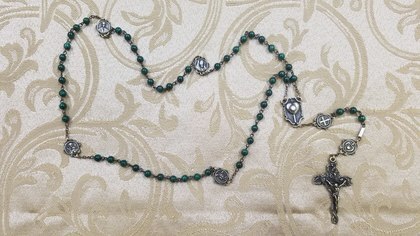 Masterfully crafted, this rosary would be a beautiful way to think of and pray for the Fr. Bernard Youth Center and her mission. Number required- Green Semi Precious Stone Beads (Malachite) REQUIRED (Select One) 0 1 2 3 4 Please fill out this field. Street Address (or Postal Address) REQUIRED Please fill out this field. Please enter valid data.